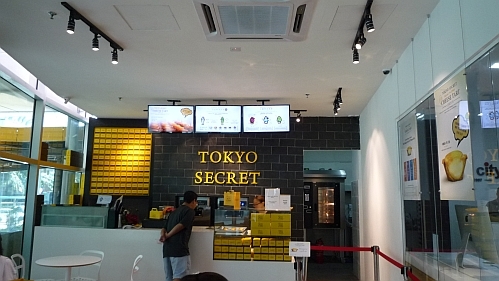 Previously I took a look at Tokyo Secret in One Utama. 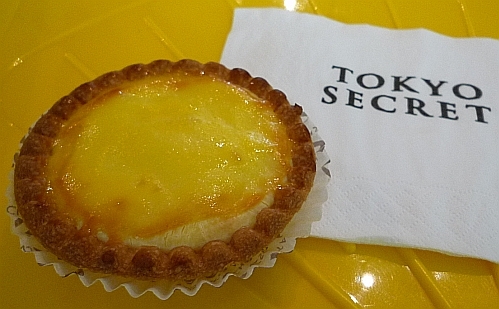 Last Sunday, I went with my friend who likes to bake cakes and cookies to taste the Tokyo Secret cheese tart in IPC. Due to its price, we bought one at MYR7.90 nett to share. View from the side. View from the top. The crust is nicely browned and the filling is golden yellow. The size is almost the same size as the usual egg tart. 1. Pâte brisée - a savory, flaky tart crust made from flour, cold butter, cold water, and a pinch of salt. 2. Pâte sucrée - a sweet tart crust made from almost the same ingredients as the above with the addition of sugar and egg yolks to give it a fine and cookie-like crust. 3. Pâte sablée - sablée means sandy in French - this is the sweetest crust and has a crumbly, sandy texture, most like a cookie. Since I am no expert, I just took a wild guess that this crust is no. 2 since it is fine and tastes like cookies but there is no one to confirm this. When we reached the middle of the tart, the filling flows out. It tastes of cheese, not that strong but good enough and the texture is not too watery and also not too gooey, just nice. It was not overly sweet and tastes very good. My friend who bakes likes this a lot because she says that the taste of the crust goes very well with the fillings and there is no overly strong taste that stands out and lingers in the mouth. The next cheese tart that I am going to try is the one from Uncle Tetsu because someone reviewed that for its price (MYR4.50 nett each), she would rather eat that than this expensive one. I would have to bring my friend who bakes with me to share that tart as well to make the same comparison by eating half each. Tokyo secret has a small shop in IPC on the ground floor. 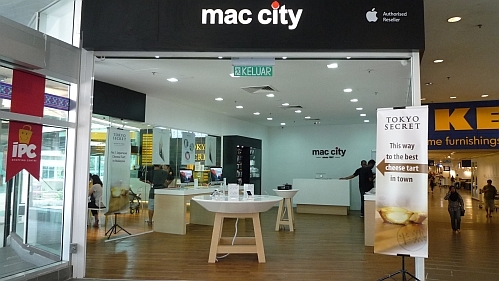 There are two entrances, one from Mac City and one from the street outside which I don't think is ready yet because it looks like it is still under construction. No queues but you will need to place your order, pay for it and then come back to collect it because there are people waiting for their orders before you. There are 3 small tables in this shop for waiting customers. Those egg tarts must be of very poor quality. RM4.50 is cheap! Here, it is RM4.80 - my Kuching cousins went that day when they were here and bought one for me - heated it in the oven and tried. 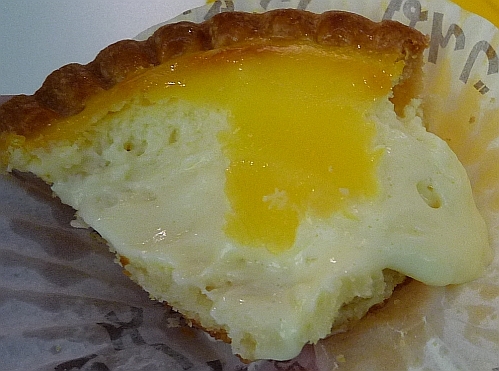 The crust was good, like good egg tart crust - the regular not the Portuguese ones. The filling was just like those rich cheese cakes that I am not fond of...so I would say the one here is nice, just not something for me. Now they have one out with a chocolate one, also RM4.80. Your MYR4.80 cheese tart must be made of high quality ingredients. The crust looked good. That is one yummy tart. The crust tastes good - not too thin, not too thick, not too sweet. I tried Uncle Tetsu cheese-tart. I didn't quite like it because the crust is crumbly but the cheese was fine but not as rich as you can get from TS. The price is so not gentle to the pocket - that's why we shared one. So you like the taste of this one better than Uncle Tetsu's. Don't think you will be bothered to buy one to try. The other day, I walked past Uncle Testu and saw the staff taking out freshly baked cheese tarts and I immediately thought of you :) I didn't buy any because I was carrying so many things. The one from Tokyo Secret, so expensive. I don't think I will pay RM7.90 for a tart especially since I am not really into cheese. Since you don't bake tarts, you don't need to buy any to try for research purposes. Hehehehe, to think you associated me with cheese tarts. You must definitely get some to try for yourself and your daughter. I love how good this Japan dessert is. So soft and so yummy. 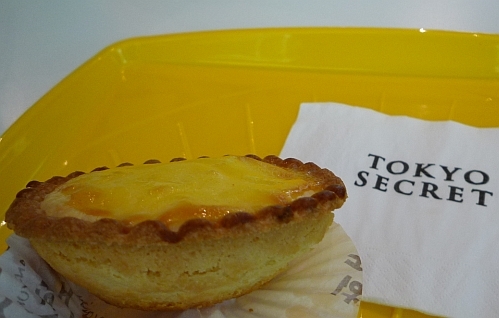 Now I am craving for one cheese tart! That is so nice to have your friend who is knowledgeable about all these to accompany you to share your tart. I love it too to have an expert dining with me to educate me more on what I'm eating. You are really tempting me with all these cheese tarts postings. Have you eaten Uncle Tetsu's baked cheese cake yet? This cheese tart is really expensive. 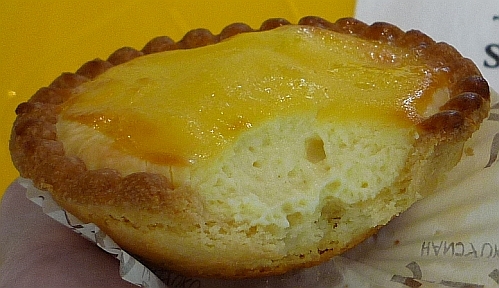 If it is really tasty and for cheese tart lovers, it is worth a try. If one can bear parting with 7.90 for one and likes to eat tarts and cheese, then can buy one to try first. This cheese tart is really like a star like that! Take photo from top, side, cross-section... hehe. Oh I didn't know there was an outlet in IPC. Can't picture exactly where it is though I see Ikea in the background. Cost so much of course is the star! :D it is opposite diagonally from Ace Hardware. You walked further away from Ikea you will see Dome and Starbucks. Won't miss it! Ahh ok ok I know Ace Hardware. Good! So try it next time you are at ipc, ua?